House bill H.R. 2675, the Low Volume Motor Vehicle Manufacturers Act of 2015, seems like exactly the kind of bill I’d love — it specifically makes provisions for companies who make 500 or less cars a year so they can sell their cars more easily in the U.S. Great, right? Sure, but the bill is arbitrarily limited to one very specific category of car. Essentially, if a maker of these specialty, niche cars uses a major manufacturer’s engine and installs it according to the manufacturer’s instructions, that car can now easily be sold as complete and finished, without having to leap through the kit-car path that many low-volume manufacturers are forced into today. the installation instructions include emission control warranty information from the engine manufacturer in compliance with section 207, including where warranty repairs can be made, emission control labels to be affixed to the vehicle, and the certificate of conformity number for the applicable vehicle in which the engine was originally intended or the applicable Executive order number for the engine. “(ii) is manufactured under a license for the product configuration, trade dress, trademark or patent for the motor vehicle that is intended to be replicated from the original manufacturer, its successors or assignees, or current owner of such rights, unless there is a preponderance of evidence that such rights have been abandoned for at least three years. So, yes, this is fantastic news for small replicar manufacturers, I agree. And I genuinely like many replicars. But I can’t help but feel that this bill is woefully short-sighted by limiting the cars it supports to replicas. What about novel new designs that are also low volume like this, like, say, the Rezvani Beast or what if someone wanted to produce a modernized, fully-manufactured version of the Brubaker box? Unless I’ve missed something crucial in this bill, it doesn’t appear to support that — and there’s no good reason why it shouldn’t. The restriction seems completely arbitrary — there’s really no technical differences between a modern re-creation of a vintage car and an original design, at least as far as this law should be concerned. Again, I have nothing against replicas — but having this bill pass and not also providing these same protections for new, original designs just seems crazy to me. 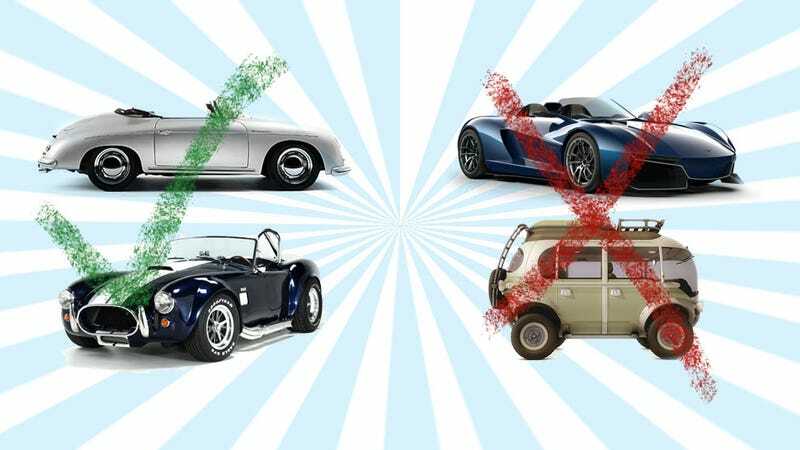 The original designs may not get the same attention or have the same nostalgic appeal as the retro cars, but they’re where real low-volume automotive innovations will happen. I really hope this bill can be amended to include cars other than just Cobra replicas and other (admittedly fun) re-animations.